Here are examples of adventures you can join. Check out the calendar to see what's planned. If you want something different, bigger, or multi-day, just ask! Take it easy and float down the Mad River in the picturesque Mad River Valley. We'll be sure to bring a few drinks and snacks for the trip. 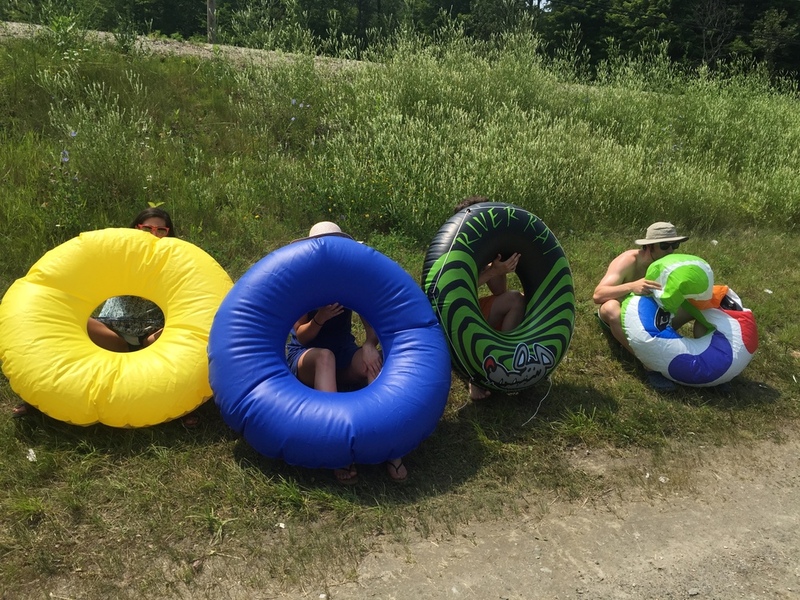 When the river flows 200-400 cubic feet per second it's hard to imagine a more pleasant Vermont activity than floating down it with food, drink and friends. Take a hike and find some of Vermont's most beautiful trails, outcroppings, and secret spots. Whether peaking with buds, exploding in rich high-summer green, glowing with fall foliage or draped in a heavy gown of white, these mountains offer year-round beauty that you'll be sure to love. Some mountains are big, and some are small, but all are beautiful. Snake Mountain is a great hike for people with less experience who still want to enjoy the thrill of a well-earned summit view. Roll for miles along the beautiful lakeside bike path, even onto the amazing Colchester Causeway. Stretching north from Burlington and tracing the lake's edge, this bikepath culminates in a several mile long causeway into the middle of the lake. Pedaling this path is an amazing way to enjoy one of the largest lakes in the country! Throw on a few more layers and enjoy the beauty of winter. Learning to love nature even when it's cold outside opens the door to many adventures. Enjoying the beauty of winter doesn't need to include ski gear and long lift-lines. Unplug from your daily grind and connect with nature all-year round. Rise and shine! Develop an appreciation for the Vermont food system by helping a local farmer with piggies, lambs and chickens and a vegetable garden for the morning. A hearty on-farm lunch and and a stop at a brewery complete this day of celebrating the local food system. If you're interested in doing this please let me know. Can't commit to a full day? No problem. We regularly offer micro-adventures (3-4 hours) that pair shorter activities with a food or beverage experience. The term "micro-adventure" (coined by renowned explorer Alastair Humphreys) addresses the belief that adventures are around every corner and can even be "small and achievable for normal people with real lives". These fast and fun local adventures will certainly scratch your adventurous itch. Some of our adventures pair great outdoor adventures with delicious meals that are sourced, prepared and consumed right on a farm. These amazing brunches, lunches and dinners are opportunities to try amazing seasonal food with a very small carbon footprint. A large group (bachelor, bachelorette, work or family) excursion, as many as 14. Take the ferry across Lake Champlain and go for a bike ride in neighboring New York. Go for a guided Burlington trail run (that's right, urban trails), perhaps with some swimming or paddle boarding at Oakledge Park. Pub crawl the next 2 miles back to town. Hop in some canoes or kayaks and take a paddle on Lake Champlain. Visit the famous Shale Hill obstacle course racing training center in Benson, VT. Visit a distillery, winery or brewery on the return to Burlington. Pack in a day of swimming holes for a real New England summer adventure. Custom-design a multi-day guided VT adventure (including hiking, biking and boating). Work with me to create a custom itinerary for your own private, perfect VT stay.